As a little girl, Ania Pettigrew loved watching her great-grandmother cook. She made big meals for the family and baked for the church. But Ania's family also knew hard times, and what it was like to be hungry. "I've been in that situation, so I know that it's really hard," she said. "Not being able to give food to yourself or to your children. It's heartbreaking. Think about how much you personally waste, how much we take for granted. We see so much on a plate that gets wasted ... that's a big pet peeve for me, when I see people scrape their plates into the trash." Now, Pettigrew is dedicated to making a better life for her family. She's enrolled in FoodWorks, a cooking program at the Maryland Food Bank. It teaches low-income students how to prepare food professionally, and helps them get jobs. The Maryland Food Bank is one of the biggest, and oldest, food banks in America. It distributes 48 million pounds of food every year, and delivers over 100,000 meals every day. And it operates on the idea that the way to end hunger is not just with food. Students enrolled in FoodWorks learn to cook with 95 percent donated food. Executive Director Tim Regan said the program gets a lot of food coming through its doors. "We get 25,000 to 30,000 pounds of chicken a week," he said. "From one source. And we're helping move more food through the system — save more food, actually — than would otherwise be possible." Usually a food bank would struggle to distribute that much raw chicken, and a lot of it would get thrown away. Wasting food wastes a lot of other resources as well, like water. According to the Natural Resources Defense Council, you'd need to let your shower run for 104 minutes to use the same amount of water it takes to produce one pound of chicken. FoodWorks eliminates water waste. It prepares over 1,000 pounds of food a day and sends it through a network of food outlets like the Salvation Army grocery store — taking pressure off food banks, waste management systems and landfills. Jamal Braxton has been in the FoodWorks program for over a month and says his class is already like family. "I definitely think I've grown a little, because I've learned about helping different people in their walks of life, homeless people, elderly people, young kids," he said. "It's a great program and I think everyone can come and just get something from it because, honestly, it's like really a life-changing program." 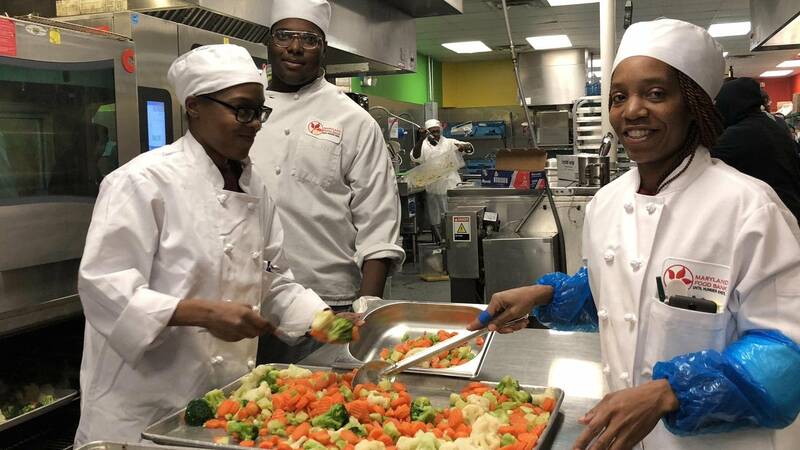 Graduates receive culinary certification from the Community College of Baltimore County, and manager-level food safety certification, which allows them to start jobs at a higher wage. Tim Regan said the program has placed students all over the culinary industry in central Maryland. "We've got them at very high-end restaurants and in public schools. We really try to place our graduates based on their strengths and based on their interests. We had one employer recently who wanted to hire a whole class, 20 people! We've been blessed by how well we've been able to place students to date." What Regan's saying is, if you give someone a single meal, you're not guaranteeing they'll have a meal tomorrow. But, if you train a person for a job, you're giving them control of all their meals to come. Case in point: After graduation, Ania Pettigrew hopes to open her own soul-food restaurant. "Soul food is traditionally very fattening, very high in cholesterol, a lot of bad things for your body," she said. "So when I do what I'm going to do, I want to make sure that it's more healthy. To be able to do that is something major, and a huge blessing." Editor's note: This story was produced with help from the Water Main at MPR, helping Americans understand the value of water in our everyday lives.